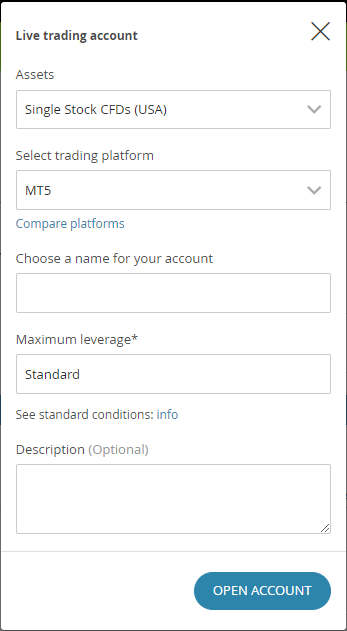 you can open as many live trading accounts, both MT4 and/or MT5, as you like and a live investor account (with or without leverage depending on your risk profile). It is possible to create a DARWIN from any live Darwinex Metatrader account which trades Forex, indices, commodities and stocks but not those Metatrader account which trade cryptocurrencies. There is a restriction on accounts trading IBEX when it comes to creating a DARWIN. SPA35 is enabled manually upon request since we have not managed to adapt our risk manager to its timetable yet. Therefore, although you can create a DARWIN from an MT4/MT5 strategy which has traded the IBEX, once the DARWIN has been created, that asset will be disabled on the underlying strategy (unless the user decides to continue trading it and not go ahead with the DARWIN).